“We are playful adults and wily children, pranksters, poets, artists, creative malcontents, inspired visionaries, culture cliff dwellers, loose cannons on the ship of fools,” the business card stated. It continued, “Each month we get together to subvert old realities and create new ones.” In bold type, it concluded, “You may already be a member!” And after reading the card, I had no doubt that I was already a part of the Los Angeles Cacophony Society, I just didn’t know it. Living in 1990’s LA was a time of great anxiety for me. I was just out of college, working a seasonal job, and sharing a condo (yes, ugh, a condo) with two Midwesterners who had just been released from the Marines. They were living the dream in Southern California: I was trying to escape. While I was too young to understand where my life was headed, I knew that I would die if I stayed in LA too long and that the Cacophony Society could keep me alive until I could get away. In the pre-Internet, pre-cell phone age I waited anxiously each month for the collage-like, photocopied newsletter to show up in my mailbox. Inside there was a calendar of self-organized events ranging from adventures in underground passages, to writing fake tickets, to dressing up in costumes and wreaking minor havoc on innocent passers by in public places. While many of the Cacophonists were obsessed with clowns (and I confess I did help create a dozen or so exploding clowns for Burning Man in 1994), I was more interested in off-kilter adventures like crashing a new year’s party at a Buddhist temple or hiking in storm drains. But no matter the event, I always felt welcome and among friends, whether I had met the participants of the day or not. Because the world was more worried about NAFTA than terrorists in those days, most of our antics were either viewed with confusion or mild amusement and only on rare occasions were we concerned about getting arrested. Such was the case with a picnic that I attended with five other Cacophonists at the Puente Hills Landfill. In typical fashion, the newsletter only contained a vague description of what we were going to do and where to meet or whom to call for direction on the day’s mayhem. 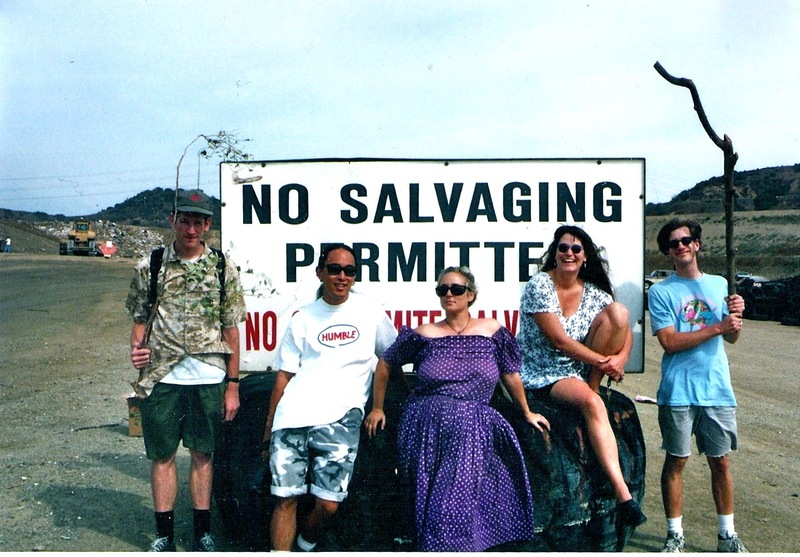 In this case, we gathered at a coffee shop and then caravanned out to the edge of the burbs and wound our way up to the top of a hill that hid a valley full of wheeling seagulls, earth moving tractors, and of course lots of trash. We pulled in next to a small, tattered office with a picnic table out front. In the distance we could see the mountains of garbage and despite the proximity to all that waste, there was hardly an aroma at all. It didn’t take long for six, twenty-somethings spreading out an array of food to attract the attention of the landfill’s employees. “Hey, you guys here to drop something off?” inquired an employees with a thick Spanish accent. “Oh no, we’re just here for a picnic,” replied one of my friends. The Spanish guy disappeared into the office. My first thought was that he’d gone off to get some reinforcements to evict us from county property. We ate for a while, relishing the strangeness of our situation and then he returned with another sheepish worker. This being a Cacophony event, whether we were conscious of it or not, drawing attention and creating tension was part of the fun. “So, you’re just here to see the dump?” he asked, seeming more hopeful than concerned. “Yes, that’s it,” ventured our leader. The men looked at each other and unable to come to any other conclusion, the men whispered quietly for a moment. Instead of kicking us out however, they deemed our picnic a validation of their vocation. 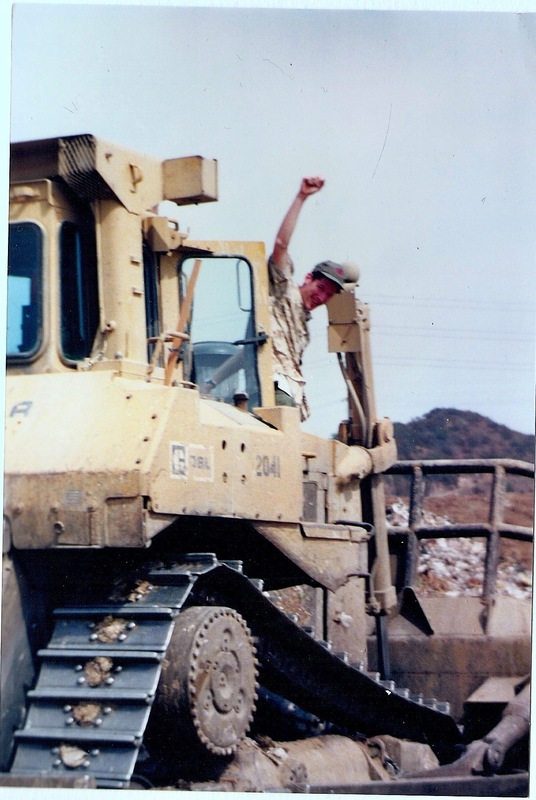 Soon we were invited to ride inside the giant tractors and earth movers that we’d seen from a distance. We looked at each other with glee, disbelieving what we were being offered. Without a moment’s hesitation, we climbed the ladders, boarded the garbage movers, and roamed over the heaping piles of trash. The formerly annoying seagulls were now our cheering fans, the sun took on a new brilliance, and the anxiety that plagued my regular life was momentarily forgotten. The workers were proud to show us what the machines could do and we were thrilled to see. As we climbed out of the tractors, we raised our fists in the air like victorious dictators posing for a crowd of news photographers. Reviewing the day’s images some weeks later, I wasn’t sure if we had subverted reality, or if it had subverted us. Talk about an urban adventure!